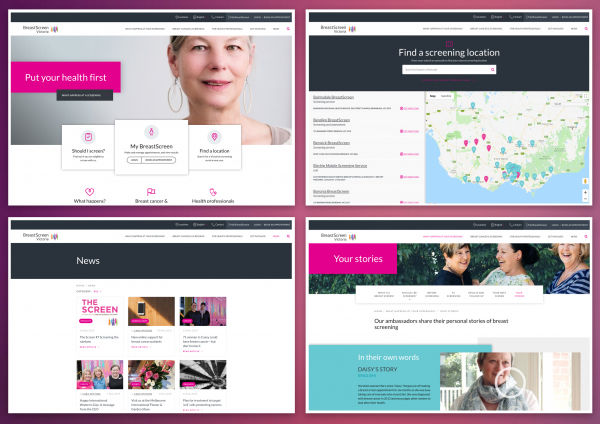 As a central figure in women's health, BreastScreen Victoria (BSV) aims to reduce the impact of breast cancer diagnosis through early detection, ensuring that all women have the best possible health outcome. With such high ambition, BSV engaged Soul+Wolf after a lengthy tender process to deliver a digital solution that would meet their goal: To help more women understand more about screening to get screened sooner. BSV’s website plays a critical role in distributing information about breast screening. This information, often time-critical and always sensitive in nature, meant that it was imperative the website not only displayed information in a way that’s easy for users to find and digest, but simple for the BSV team to scale and maintain up-to-date. The goal of the project: To help more women understand more about screening to get screened sooner. 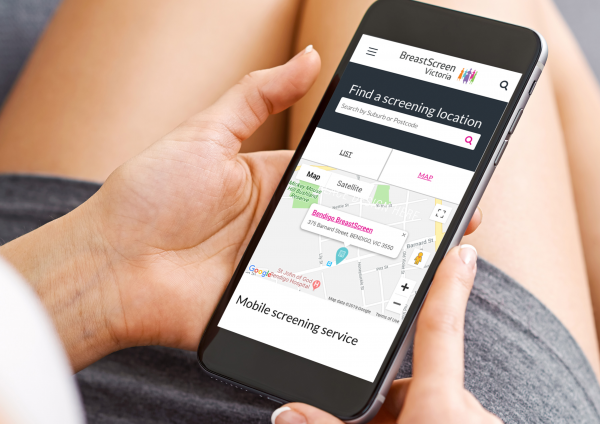 The project brief was largely open-ended, but needed to include a number of unique features and user-friendly functions to achieve this goal, including easy access to screening-related content, BSV screening locations and the MyBreastScreen user portal. 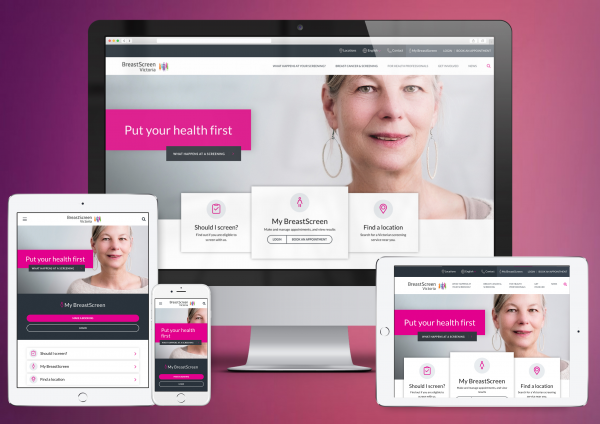 To achieve the project goal, the proposed solution needed to position and reaffirm BSV as an established and trusted online source of information and promote the MyBreastScreen user portal where possible and relevant. By achieving this, we could help women understand more about screening and the screening process, to then encourage them to find a screening location and ultimately book an appointment. To do this effectively, we would need to provide a positive and welcoming user experience to a diverse group of users who would later be better defined. By conducting multiple rounds of user interviews and tests, a journey of related content could also be developed across the site to help guide and funnel users from content consumption to booking an appointment. With such a broad demographic and ethnicity of users accessing the website, translatable content was identified as critical for not only them, but for Health Professionals as well. The largest, and most important challenge of this project was understanding the various demographics and users who would be accessing the website and the technologies that they’d be using to do so. Through stakeholder interviews and user surveys, we discovered a very diverse group of users, mostly women (of different ages) with varying technical competencies, accessibility levels and language/ literacy barriers. 2. 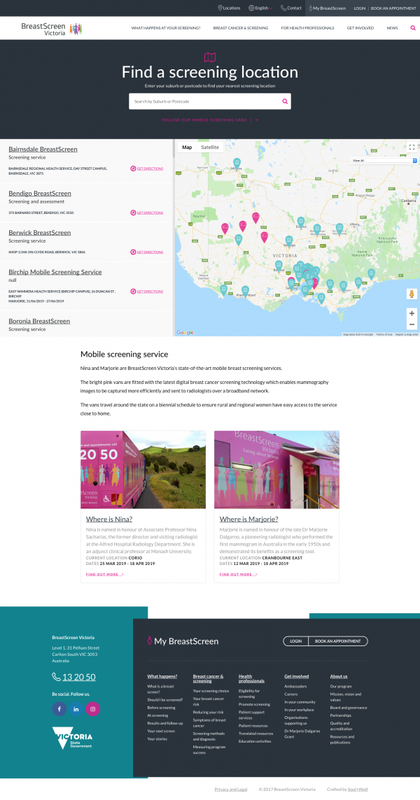 How do we help these users find BSV screening locations and improve access the MyBreastScreen user portal. It should also be noted that the solution required conformance to WCAG 2.0 Level AA. With design-lead thinking and multiple rounds of user tests, we delivered a solution that not only answered various design challenges, but genuinely helps a diverse group of users better access and understand screening-related content. 'What Happens' and 'Breast Cancer & Screening' are critical information sources for women exploring the signs and symptoms of breast cancer. In the 9 months following the launch of the website, this content has been seen 95,219 times - a 319.45% improvement from the old website. In that same time, we've also seen a 106.42% lift in views of BreastScreen Victoria's location-related content. - A 1:10 increase in Average Session Duration YOY with the number of pages per session also increasing by 14%. We are extremely proud to have been involved in this project. The BSV website does not gather any personal information on its users.